This is the next post in my series on how search & seizure issues impact criminal cases in Phoenix, Arizona. My last post discussed when the Fourth Amendment protects one from unlawful searches or seizures. This article continues that discussion by explaining that are instances in which one does not have to talk to the police. If you were arrested by law enforcement, and believe your rights were violated, then contact an attorney immediately. My last article explained that law enforcement cannot stop and question someone simply because they wish to do so. The Fourth Amendment requires police to have “reasonable suspicion” of criminal activity in order to detain someone against their will. Police, however, are not prohibited from approaching someone and asking them to voluntarily speak with law enforcement or to voluntarily subject themselves to a search. Evidence discovered during a “consensual” search can lead to prosecution the same as would evidence found during a seizure. This does not mean that all evidence found by law enforcement is allowable. While the authorities may attempt to argue that recovered evidence was the result of a voluntary or consensual encounter, you may still be able to challenge the use of such evidence in Court. The Fourth Amendment prohibits the police from stopping and questioning someone in an unreasonable manner. A stop will not be unreasonable if the suspect stops and interacts with the police voluntarily. What is “voluntary,” however, is open to interpretation. If a Phoenix, Arizona resident, for example, is walking down down the street and approached by an officer then it will be voluntary if the officer says “will you stop and speak with me for a moment” and the suspect says “sure.” If, however, the officer has their hand on their firearm and uses a threatening tone then a Court would likely hold that the stop was not voluntary; the police may not intimidate a person into consenting to being stopped. If you were stopped and felt you had no choice but to talk to the police then it is possible your rights were violated. Phoenix defendants may challenge the use of evidence seized during a consensual stop. The first step will be for your defense lawyer to file a Motion To Suppress in which it is articulated why the stop was, in fact, not voluntary. The Court will look at the surrounding circumstances of how the defendant was stopped. If the Court finds that a reasonable person had no choice but to talk to the police then the stop will be considered non-consensual. If the officers did not have reasonable suspicion to justify the non-consensual stop then any recovered evidence will not be admissible at trial. 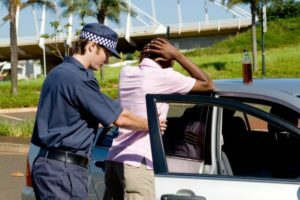 If you feel that your rights were violated, and you are now facing charges, then it is important that you consult with an attorney immediately. In addition to Phoenix, I also service other Maricopa County cities such as Mesa, Glendale, Scottsdale, Chandler, and Gilbert and I assist Pima County residents in Tucson. Call today to speak with an lawyer.